Here is my latest version of the Real Estate Appreciation chart. 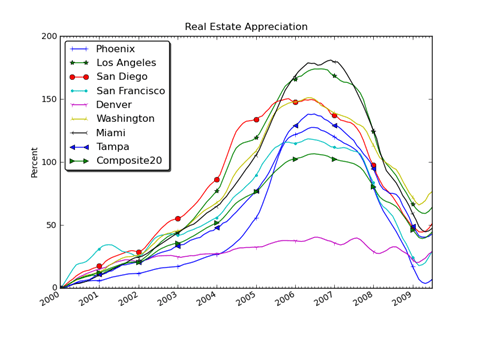 This chart displays the real estate appreciation as reported by the S&P/Case-Shiller Home Price Indices. This graph differs from the previous graph in that it shows the monthly values versus the annual values. The $64 question is whether the 2009 uptick will continue. There are a lot of mixed signals in the real estate market.